yeah, I hate sliders too. Anyway, I just solved it somehow, bottom right piece is the emtpy, but nothing happened, does not give me anything. Hehe, i just pushed the buttons randomly and a panel opened on the wall and gave me the last piece of slider, and there was a gold key. Not too bad of a game. 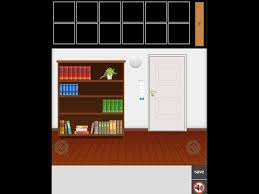 Has some clever puzzles and I do agree that the Slider was a pain. Yes, I understood: the faded or lit letters of the words draw figures in the picture of letters! Thank you! That was splendid! Needed some thinking, but everything was logical. The toughest part for me was probably finding the spot for the torch/flashlight. Books on the shelf are clues for two different things. I hate sliders too, but this one was easy for me. Not sure why, other than I did it without the extra piece. Really glad it didn't reset, after I zoomed out!